Thought I’d do a post on a long-time favorite air gun, namely the Sheridan Blue Streak. Might provide some useful info if you ever run across one for sale. Think of this as a library reference. Bought my first Sheridan in the mid 70s and, over the years, I was rarely without one. 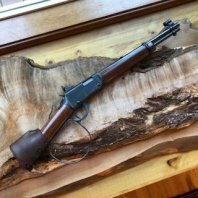 The Sheridan is a multi pump air rifle, very similar to the Benjamin pumps of that day, but what made it a little special was that it was a 20 cal and, only, a 20 cal. Never commercially made in any other caliber. It was also a quality gun, all metal and walnut, made to last a lifetime and made right here in my home state of Wisconsin, down in Racine, beginning in 1949. Mint 1985 vintage Sheridan with Williams peep. 1985 was the first year Sheridans were drilled and tapped for a peep sight, though Sheridan did offer that feature, previously, as a factory option. A peep is definitely my favorite sight for Blue Streak. Back in the day, I used the Sheridan as a fun, low cost to shoot plinker and I also used a Sheridan for a lot of squirrel and rabbit hunting. Those old cylindrical Sheridan pellets weren’t the most accurate, but they had amazing penetration. 6 pumps was enough to shoot a pellet right on through a chest on a squirrel or rabbit out at 20 yards. So what’s all the fuss? The Blue Streak (and the silver version, the Silver Streak) was just one of those guns that you hate to put away, once you start shooting it. It’s a gun that has character all it’s own. Little wonder, then, that the Sheridans have a cult following to this day. I’m definitely a charter member. For me, a session with one of the Sheridans is a most pleasant trip down memory lane. As for accuracy, never really sat down at a bench and tested one for accuracy in those days, but, as you can see, maybe I should have. The Sheridan action is simplicity in itself. Very easy gun to maintain and also a very easy gun to lighten up the trigger. Seal kits are still readily available, should your Blue Streak leak, but even though my oldest Sheridan in the collection is a 1968 model, it still shoots as strong as ever, as do all the others I own. Like I said, these were guns made to last. In 1976-77, Sheridan was bought out by Benjamin, but this is one of the few examples of a buyout done right for customers. Benjamin continued production of the Sheridan in Racine and even moved the production of their own models, there. Most importantly, quality was maintained. Sadly, such was not the case when Crosman bought out Benjamin-Sheridan in the early 90s. Closed down the Racine plant and moved production to E. Bloomfield, N.Y. Crosman then did some major mods to both the Sheridan and Benjamin line of pumpers, mostly to make them more affordable. The C9 Blue Streak, Crosman’s version, really is a different gun to us Sheridan fans, though it is still a good shooter. The C9 Sheridan was recently discontinued by Crosman, so the Sheridan is no longer in production. Really an end to an era. Even those less than mint Sheridans can still shoot. Here’s one of my utility grade Blue Streaks I’ve been shooting this week. It’s a well used and a little rough around the edges 1977 vintage Blue Streak. When I found it in a pawn shop, every single steel part was rusty. Cleaned it up, though, enough to shoot, added a cheap 4x air gun scope and ended up with another great shooting Blue Streak. Maybe some day I'll restore it, but in the meantime, it's see a lot of duty around the yard and in the basement. In the basement, this week. In case you are tempted to look for a Sheridan Blue Streak, be advised that prices are steadily on the rise. I see a lot of then, now, well north of $200 and even $300. The most I paid for one is $200, but this 1972 version came from the original owner, manual, receipt and all and is absolutely spotless. The other five in our collection were true bargains, by today’s prices. All were bought for under $120 over the years. Please feel free to ask if you have any questions on this great American classic air gun. Hope you enjoyed it. I still have the Blue Streak I got for Christmas in 1972. Still shoot it once in awhile. Have killed squirrels rabbits a few groundhogs and God knows how many blackbirds and sparrows with it. Going to run a few pellets over the chronograph someday just out of curiosity. I can remember saying I'd never own a GLOCK,never own an AR15 and never get married. I found out that never is a long,long time! Great to see another Sheridan shooter post, here. Wasn't really expecting a lot of replies to this one. Wrote it mostly as a reference, but good to know I'm not the only Sheridan fan, here. The Sheridan is no powerhouse by today's standards and from what I've researched, it's in the same neighborhood on velocity as my classic Benjamin pumpers. One thing, though, I find that the Sheridans are easier to pump than our Benjamins, even though velocities are similar. Not sure why. Can definitely shoot the Sheridans longer before my arms give out, though. I have a Blue Streak that I bought new many years ago. I ordered it with a Williams F.P. peep site for the back site. We used to shoot at a candle flame in the backyard with it. Mine will shoot through a 3/4" pine board when given several pumps. I always leave one pump of air in it so the seals won't dry out. The Sheridan .20 caliber pellets have a hardened nose . Great reminder on how to store any kind of pneumatic. They need some air pressure in them when not in use to maintain seal integrity. If stored without pressure, the seals dry out and deform. I give all our pumpers two pumps before putting them away. Yup, those old cylindrical Sheridan pellets in the red or yellow container were known for their penetration ability. I do get better accuracy with the modern diablo style 20 cal pellets, especially the JSB Exacts, but still have some of the old pellets that I shoot, now and then, for old time's sake. Back in the day, they were the only 20 cal pellets I could find, anyway. Really like these old airguns, nice to get some information about these almost forgot about them, my brother got one a long time ago think he still has it. Remember those .20 pellets wasnt easy to get. 20 cal pellets are still not easy to get on a local basis. Local gun shops and department stores usually stock 177s and sometimes 22s, but rarely anything in a 20. The good news is that the 20 is still doing well in the air gun community and no problem ordering them online. That option also gets you a variety of choices. By far, all our Sheridans shoot the JSB Exact 20s the best. Go straight to those and you'll love what a Sheridan can do. Thanks, if I ever stumble across one I'm taking it home. Hope you find one, then. Be a perfect choice for your backyard range. Any pumper would, since you can vary the power via the number of pumps. Thanks for the .20 ammo info. I bought 1500 rounds when I bought the rifle and I still have a box of 500 left.